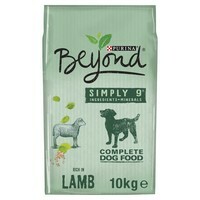 Purina Beyond Simply 9 Rich in Lamb with Whole Barley is a complete and balanced diet for your dog that contains 9 recognisable key ingredients. Formulated by experts in dog nutrition, these 9 ingredients work in synergy to provide your dog with optimal nutrition to help your dog live a long and healthy life. High Quality Lamb Cuts - Contain a rich source of proteins that help to maintain lean muscle mass and promote a healthy immune system. Omega Oils - Promotes a healthy and shiny coat, and healthy skin texture. Complex Carbohydrates - Whole Barley, Oats and Dried Vegetables provide a slow release of energy to keep your dog playing for longer.